Save over $200 when bundling this package deal! Add this package to your cart to see the items you get. You can click on each of the items in your cart to see each items full description and specs. This is a great ice cream store package deal if you're looking to replace old equipment or start your new frozen dessert business! The TKPEDC-8 is the perfect ice cream dipping cabinet. 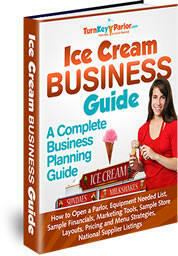 Gets you into the ice cream business fast, easy and for a great price. Holds 14 three gallon tubs - 8 on top and 6 in storage. These are fully self contained, meaning they don't need a drain. These freezers plug into a standard outlet (115v) so no issues there. The sliding glass lis and the 3 gallon tub holders are included. Best warranty in the business. 5 years on compressor, 1 year on parts and 90 days on labor.